Syntel Off Campus 2019: Syntel is now looking for the talented and skilled graduates and postgraduates across India like in Hyderabad, Chennai, Mumbai, Maharastra, Delhi, Cochin, Bangalore, Mysore, Lucknow, etc. The officials had disclosed the details about the Syntel Online Registration for freshers. Before going to the application for Syntel Off Campus 2019 you need to check the Eligibility Criteria. So, the interested and talented candidates who passed in the year 2018, 2019 can now apply for the job through the registration links given at the bottom of this post. The current article is providing the entire information about the eligibility criteria, registration process, selection process, drive details, salary details, etc. 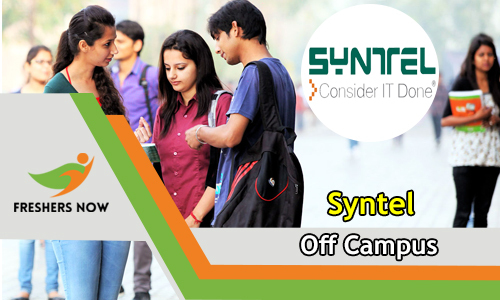 Moreover, for the sake of candidates who want to register for Syntel Recruitment process, we have been provided the direct link to Syntel Off Campus 2019. Definitely, Syntel is conducting the Off-Campus drive every year across India. So, the candidates who are willing to work with the company can now apply for the job through this post, the registration link is given below. Furthermore, the Syntel is conducting the interviews All over India, there will be tough competition to crack the selection rounds. Therefore, every candidate who is willing to apply for this job is suggested to prepare well for the job. So, by gathering all the stuff you can easily crack the Syntel Off Campus Recruitment 2019 Drive. And, also you have to practice with the help of Placement Papers, Syllabus and attend online testaments in order to, attain the job. Syntel is a global company that offers the world of opportunities for fresher candidates. So what are you waiting for? go through our entire article in order to get aware of the different sessions and to register for Syntel Off Campus Recruitment 2019. Therefore, we suggest you read the Syntel Off-Campus Recruitment drive details. And, any Graduates and Postgraduates are eligible for this interview. There is also a chance for 2017 and 2016 candidates. Furthermore, the job is an entry-level engineer, and it is off-campus recruitment and held all over across India. The competition might be tough. Hence, the candidates are requested to prepare well for the interview in order to grab the job. Syntel is a U.S. based multinational provider of integrated technology and business services headquartered in Troy, Michigan. The Syntel utilizes development centers in India. And, Syntel is a certified minority-owned business (MBE). The company is led by CEO and President Rakesh Khanna. Syntel’s growth during the early years prompted their leadership to explore additional service offerings to augment the core IT staffing business. Furthermore, it has 30 worldwide facilities located in the United States, the United Kingdom, Germany, the Philippines, Australia, and Canada. And, the company’s offshore software development centers are located in Mumbai, Chennai, Gurgaon and Pune, India, as well as Manila, Philippines. Unisys’s U.S. based development centers are located in Phoenix, Arizona, Nashville, Tennessee, and Memphis, Tennessee. The services provided by Syntel are IT services, Business Outsourcing and Business consulting. The people who are comfortable with the drive details can now check their eligibility criteria given below. B.E/ B. Tech, B.Com, B.Sc, and all other Graduates and Postgraduates are eligible for Syntel Off Campus 2019. Academic Percentage of a minimum of 60%. All Graduates and Postgraduates should have a minimum of 60% are eligible. They should have more than 60% in X standard, XII standard, Graduation, and Postgraduation. Diploma students with more than 60% are also eligible for this job. There should be no backlogs. Therefore, if any backlogs the student’s profile will be rejected. Firstly, we have to register for the company. Nextly, you have to upload your resume. After, shortlisting all the resumes if you are eligible for the job you will get a call. There will be four rounds conducted in the Syntel recruitment process. Colored as well as Black And White photocopies. The Syntel Online Test has around 90 questions from Verbal, Analytical Ability, and Quantitative Ability. Syntel Placement Test is for one hour. In the Verbal section which includes 30 questions, the contenders will have to solve reading comprehensions and questions based on basic grammar usages like fill in the blanks, synonyms, sentence completion, antonyms, paragraph completion, and vocabulary, etc. The Analytical Ability section around 30 questions will test the applicants on data interpretation and logical reasoning skills. The Quantitative section Ability consists of 30 questions from algebra, time & work, time, profit & loss, speed & distance, arithmetic, percentages, and geometry, etc. There are no negative marks in the paper. Fill in the particulars given below. And, then click on Submit. In conclusion, to this, we hope that the information that we have provided about Syntel Off Campus 2019 Drive for Freshers, Online Registration is helpful to you. Now, you can apply to Syntel Off Campus, Syntel Registration for Freshers, Syntel Off Campus 2019, Syntel Recruitment Process through the registration link given above. For more updates keep browsing our website freshersnow.com.